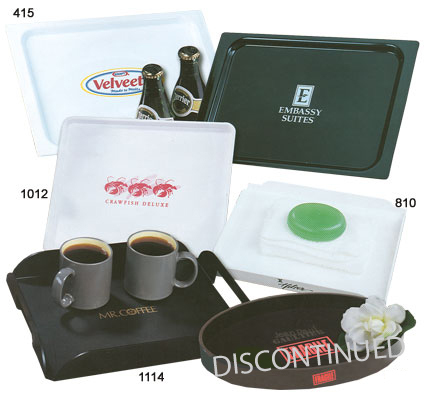 You can custom print these Square, Oval, and Rectangle Serving Trays with your logo and message. Choose from many tray styles and colors including, our popular 11" x 14" Rectangle Serving Tray with carry handle. 415 & 1012 – 6" x 4"
1114 – 6" x 4"
For additional information on our Rectangle, Oval, and Square Serving Trays and other Bar Supplies, please contact us at 1-800-233-0828.